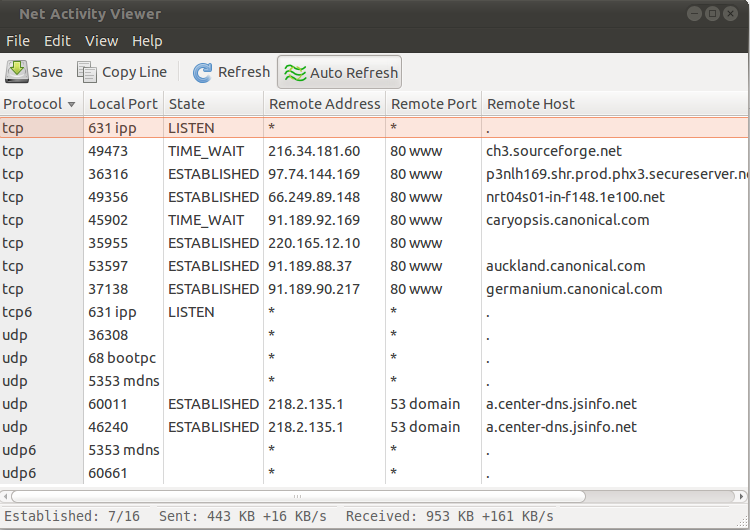 Netactview (Net Activity Viewer) is a graphical network connections viewer for Linux, similar in functionality with Netstat. It includes features like process information, host name retrieval, automatic refresh and sorting. It has a fully featured GTK 2 graphical interface. * Shows all udp, tcp, udp6 and tcp6 network connections in an automatically refreshed list. * The presented information includes protocol names, addresses, ports and connection states along with host names and process information. * The connections list can be sorted by any of its columns. * Refresh rates ranging from 1/16 to 4 seconds, or no automatic refresh can be selected. * Connections can be seen for 3 seconds after they are closed giving you the chance to spot connections that last very little time. * The unestablished connections can be filtered out. * Multiple connections list snapshots can be saved in a formatted text file. After install the deb,you can start the gui from Applicatons -> Internet -> Net Activity Viewer. 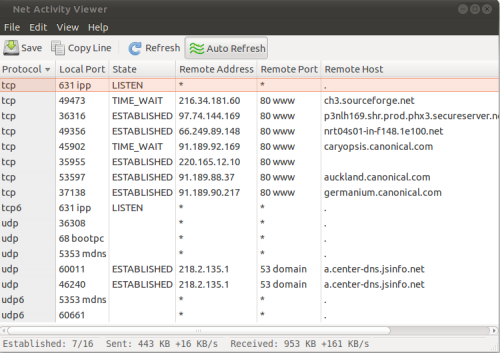 No user responded in " Netactview similar to TCPview,a graphical network connections viewer for Linux "